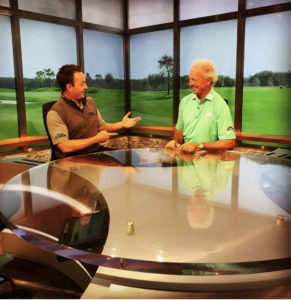 Orlando, FL — It was my first time being on camera for the Golf Channel. Honestly, I didn’t know what to expect. The format was Q and A so I couldn’t script anything, I just had to roll with whatever they were gonna say- so improvise by falling into my comfort zone, which is the game of golf and my teaching philosophy. As you can imagine, as with anything new, it was exciting, fun, and slightly terrifying all rolled up into one experience. About 45 minutes before show time, I came across some fun colored teaching aids at a booth, I thought they would be great for the Golf Channel appearance. But, that was also a risk because I hadn’t used them before and this was my biggest teaching debut. I came to the conclusion that life is full of risk and rewards. I took my new toys to the studio and saw my co-instructor, Bruce Wilkins. I showed him the new toys I found and his eyes lit up. I told him he was welcome to use any of them during the show. Instantly, we were a team! Then, our host Alex O’Laughlin showed up and we met and put on our mics. I sent a video to my wife telling her I loved her. (It’s always fun to share in-the-moment experiences with the ones we love most in the world.) Next, our producer informs us that the internet connectivity isn’t good enough to do a Facebook live and will go off other questions. Focus, adapt, improvise is the name of the game! Then Bruce tells me he is “left handed” and I would be hitting all the shots for the show (its easier for everyone to understand a right handed demonstration than left handed). 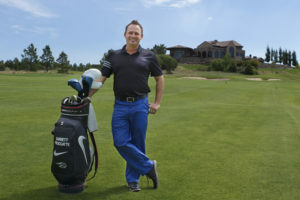 I began hitting balls and warming up before the cameras started rolling. It was calming to know I could still hit a ball with all that was going on. “Action” we started the show and Bruce took the first question and I followed his lead. It felt like we were just teaching and doing the stuff we do everyday. When it was all over it was a rush much like finishing a rollercoaster ride — Scary at first but was so exciting when it was over. People You Meet Along The Way. David Leadbetter, No Joke! I met one of the most influential teachers of all time, David Leadbetter. 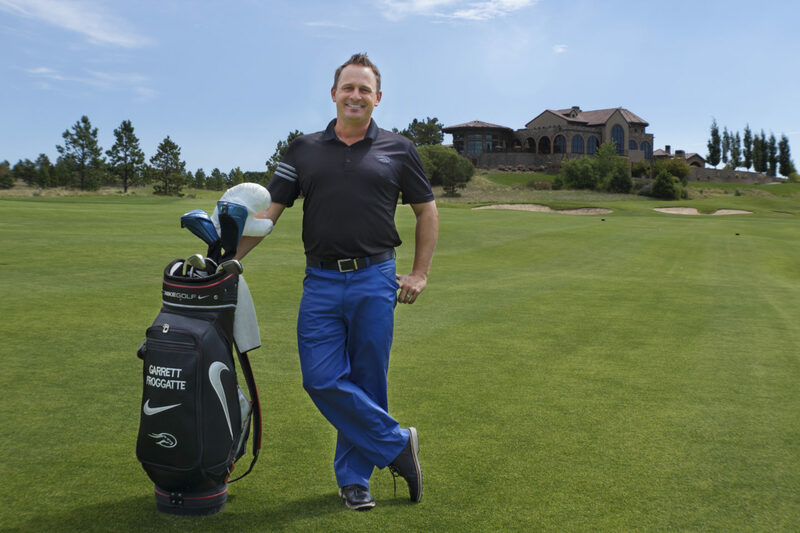 I joined the EyeLine Golf Team to help demonstrate putting products to the Leadbetter staff. A few thoughts on spending time with David Leadbetter and his staff. The most notable takeaway for me was how comfortable their staff seemed around a former #1 Teacher in the world. The culture within academy was remarkable, it didn’t an ounce of “don’t make a mistake” but of “let’s be excellent, have fun, and enjoy our jobs”. Sometimes around great leaders it can feel scary but in this culture the followers seemed to feel valued and relaxed. A simple example of this was that David would listen intently to whomever was speaking to him and his staff didn’t hesitate to approach him. We also had a chance to spend some time with James Sieckmann, the PGA Teacher of the year for 2018. EyeLine Golf is producing a product with him and my father was going of the details and changes. Its been such privilege to meet and interact with my dad work with Haney Hank, Stan Utley, James Sieckman, Michael Breed and others. The Show is Huge and the Opportunities are Endless. Anything golf you want to find from simulators, to golf robots that teach you the perfect swing, to clubs, clothes, and training aids – they’ve got it all. I have been to this show 15 (or more) years with my father/brother’s company www.Eyelinegolf.com working and selling product. 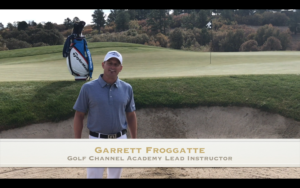 This year I was there as a Golf Channel Lead Instructor. It felt different for sure not being a salesman but being an instructor. It took a while for people who saw me as the son of the great Sam Froggatte, putting training aid guru, to golf instructor of the full swing. But then I took the stage at the Golf Channel, mic turned on, camera rolling. Man. What an experience! I wanted to make sure to capture this in my blog because there are many more adventures to come and I hope you’ll come along for the ride as I continue to share my journey!